This post is sponsored by ALDI. Opinions are my own. Always have been. Always will be. We recently shared our ALDI inspired DINNER PARTY where our guests noshed on a Mexican-themed dinner with drinks. TACOS AL PASTOR was the star of our menu. 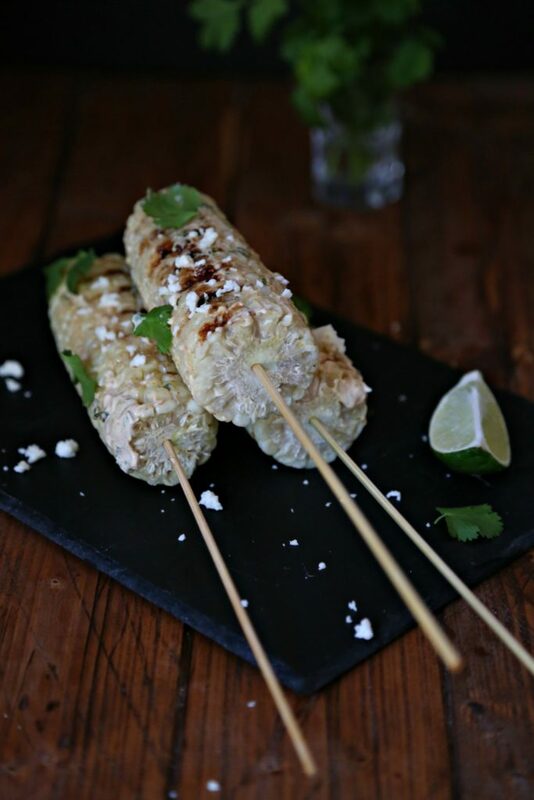 Everyone loved the tacos but they also couldn’t get enough of one of the side dishes, Mexican inspired street corn. 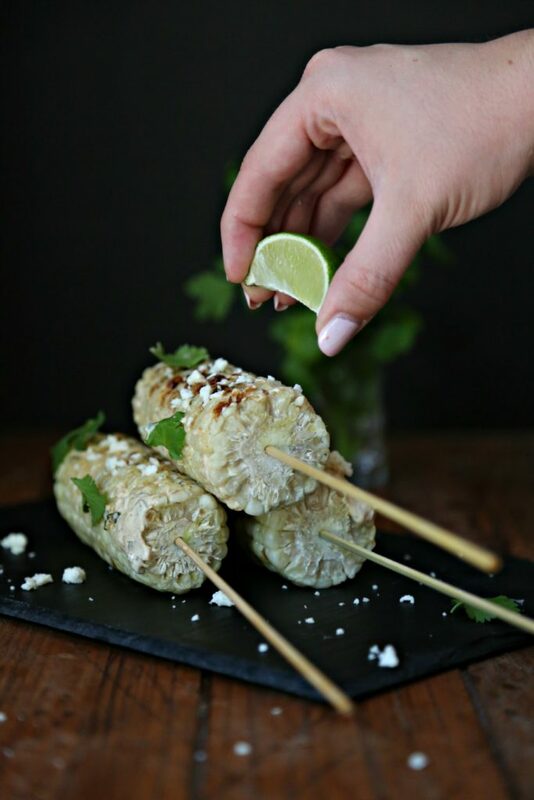 It’s corn on the cob that’s slathered with a creamy chili and lime-based sauce and then sprinkled with cheese. It’s simply amazing and the best part is that it’s incredibly simple to make with the help of a little shortcut. To source all of my ingredients, I made a quick shopping trip to ALDI; their produce section always has a great selection (including organic options) and you can’t beat the prices! To make this corn you’ll need: sweet corn, mayonnaise, sour cream, chili powder, limes, fresh cilantro, garlic and queso fresco. Street corn is typically grilled, but because I was serving it at a dinner party I took a shortcut. I STEAMED the corn in my microwave first and then simply placed it on my grill pan to get the grill marks while my taco meat was cooking; timing it perfectly so they were both ready at the same time. To save even more time, you can mix the sauce in advance so it’s ready to slather on the corn as soon as it comes off the grill (or in my case grill pan). Top with crumbled queso fresco and cilantro and serve with a side of lime wedges. It was the perfect accompaniment to our Tacos al Pastor. The corn is sweet and the sauce is slightly spicy, making it a delicious flavor combination. Plus, who doesn’t love food on a stick? I absolutely love the ease of shopping at ALDI. The stores aren’t gigantic, which makes it easy to navigate the aisles – getting me in and out quickly. They always have an awesome selection of products (including options for specific dietary needs – think gluten free and organic), including exclusive store brands that are just as good as national brands, if not better (be sure to also check out their award-winning wines, too!). Last but not least, their prices save me money and that is a very good thing. With hundreds of stores across the country, chances are there’s an ALDI store near you. If you haven’t already, why don’t you see for yourself what they’re all about. 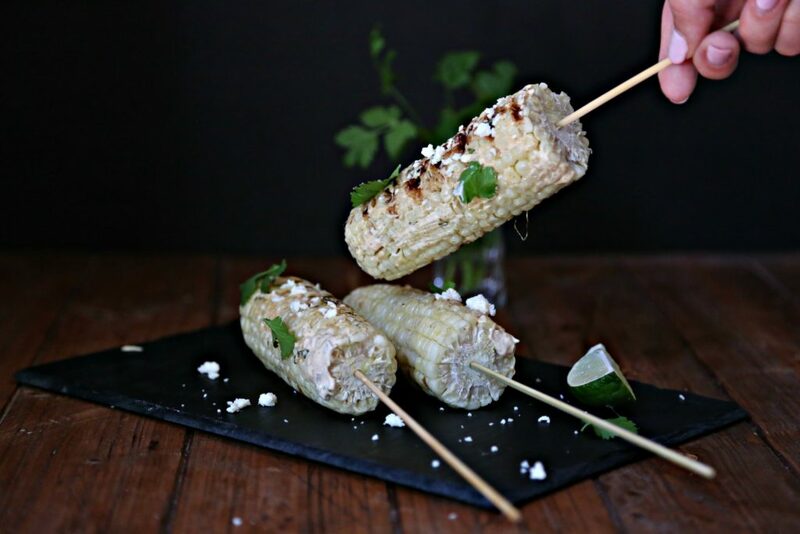 Name: Mexican Street Corn Image: https://bellalimento.com/wp-content/uploads/2017/05/Mexican-Street-Corn-1.jpg Description: Prep Time: 00:10 Cook Time: 00:05 Inactive Time: Total Time: Total Servings: 8 Ingredients: 8 ears sweet corn 1/4 cup Burman’s mayonnaise 1/4 cup Friendly Farms sour cream 1 teaspoon Stonemill chili powder 1 clove garlic – minced 2 tablespoons minced cilantro 1 lime – juice and zest of 2 tablespoons Countryside Creamery unsalted butter 1/4 cup Pueblo Lindo queso fresco – crumbled Directions: Steam corn in a microwave safe container according to microwave directions. Into a small bowl combine: mayonnaise, sour cream, chili powder, garlic, cilantro lime juice and zest. Mix to combine. Set aside. Place a grill pan over medium heat. Add corn. Top with butter. Cook, turning as necessary, until you have grill marks. Carefully place skewers on cooked corn. Slather with desired amount of sauce. Top with crumbled queso. Notes: Serve with lime wedges if desired. You can substitute Mexican crema for sour cream. Mexico run corn is the best! I can’t wait to make this recipe, I never thought to steam corn I. The microwave either, great idea! Mexican street corn is my absolute favorite way to have corn! Yum, and I love this shortcut since sometimes it’s actually too hot to grill here! THIS will be the year I officially make Mexican Street Corn!! YUM! I love the sound of this because it’s SO perfect for the summertime! I adore Mexican street corn! I can see why this was such a hit at your dinner party.